Oddly, I hadn’t seen Wonderful Life in a good couple of years, despite it being one of my favorite films of all time. Ever. In the history of filmdom. Or ever. There was a while in this country when you could literally spend Christmas Eve flipping from broadcast to broadcast, as each channel played it in turn, and some years, that’s just what I did. In Israel, I watched it a few times on December 24 on Middle East TV (an odd evangelical station that broadcast from Cyprus but talked as if it were in Lebanon), and would inevitably feel oddly bereft for a few hours afterward. But it’s been awhile. So last night, sharing it with my kids, as the snow fell lightly outside our window and we all snuggled up under blankets, felt good. What has always held me so close, I think, is George Bailey’s humanity. He is a round character, a man of flesh and blood and dreams and resentments, a man who fails to live up to his own standards now and then, a man who is deeply good but is also, in the end, deeply human. This is, to my mind, the real genius of the movie. But last night, I gained something new, too: George’s life — for all the divine intervention and love of his fellows — isn’t made to magically meet his dreams. He isn’t given a cruise ticket by Uncle Billy, or a job in London by Sam Wainwright. Mr. Potter doesn’t get his comeuppance, or a well-deserved prison term. George is left with precisely the life he has been forced, through temperament and circumstance, to build for himself. You reap what you sow, and George has sown love and respect — and he gets that in spades, as the movie closes. No, George is as caught, and as stuck, as he ever was. The giddy joy in the end comes of suddenly knowing the real value of what he has, even if it’s nowhere near what he wanted. It is perhaps unsurprising that this aspect of the film (something that was clearly always there) resonated with me as Aught-Nine draws to a close. I am, minus the threat of a jail term, George Bailey — a middle-aged American with unfulfilled and apparently unfulfillable dreams, all the appropriate resentments and occasional throwing of fits, and what is, bottom line, a Wonderful Life. No angel, but I have read Tom Sawyer. Perhaps my goal should be to live a life that will leave an awful hole. I couldn’t help but notice over the weekend that I was all but ignoring the fact that it’s been a year since the outbreak of the war in Gaza — and yet was focusing obsessively on Iran. I’m not proud of this fact, but I think I understand why: Having lived, studied, and written about the realities of the Israeli-Palestinian conflict for (I finally figured it out last night) a total of 27 years, I am all but bereft of hope for that part of the world. Iran, on the other hand, for all the mayhem and the blood — well, it’s like hope on a stick, isn’t it. One place looks like no one will ever find a way to break out of the grinding cycle of hatred and willed ignorance and power dynamics that get spun as Israeli victimhood, and the other looks like a grand awakening, a noble grasping of human dignity in the face of despair. Which would you rather think about? I will allow that it was not an intentional act, and it’s not an urge that I’ll give into. As an Israeli, I owe the hundreds of Palestinians killed a year ago, the thousands of Palestinians killed since the mid-80s, my best effort to secure a just peace. As an Israeli, I owe my fellow Israelis whatever little contribution I can make to securing their future — and without peace, I’m pretty certain Israel will eventually disappear from history. I remind myself that women’s suffrage took 78 years to achieve in America, that from the publication of the first abolitionist newspaper to the establishment of the Civil Rights Act, some 130 years passed. The arc of the universe bends toward justice — it just does so slowly. But I will confess that, in retrospect, I’m not surprised that I remembered the Shi’ite holy day of Ashura, and forgot the my own country’s War on Gaza. The estimable Rabbi Brant Rosen did not forget, however, and posted this wrenching piece on his blog about his own reactions to the war, and the view from the distance of a year. As a Jew, I’ve identified deeply with Israel for my entire life. I first visited the country as a young child and since then I’ve been there more times that I can count. Family members and some of my dearest friends in the world live in Israel. Last year, however, I reacted differently. I read of Blackhawk helicopters dropping hundreds of tons of bombs on 1.5 million people crowded into a 140 square mile patch of land with nowhere to run. In the coming days, I would read about the bombing of schools, whole families being blown to bits, children literally burned to the bone with white phosphorous. Somehow, it didn’t seem so complicated at all any more. At long last, it felt as if I was viewing the conflict with something approaching clarity. I urge you to read the whole thing. And to take a moment to remember what the war did to the people in Gaza — and what it did not do for Israel: Stop rocket attacks, or bring Gilad Shalit home. Last year, however, I reacted differently. I read of Blackhawk helicopters dropping hundreds of tons of bombs on 1.5 million people crowded into a 140 square mile patch of land with nowhere to run. In the coming days, I would read about the bombing of schools, whole families being blown to bits, children literally burned to the bone with white phosphorous. Somehow, it didn’t seem so complicated at all any more. 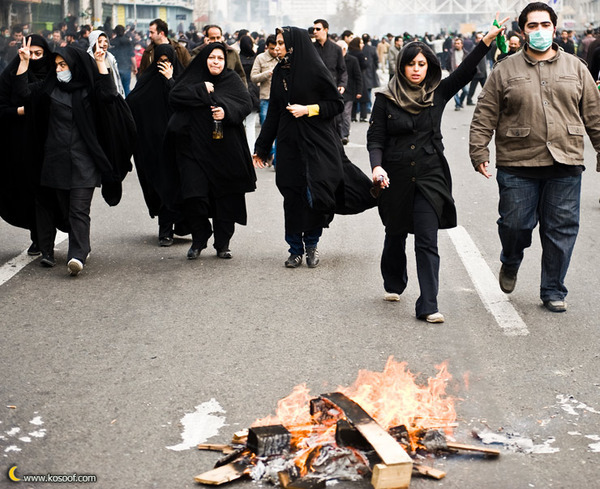 Sunday brief: Following events in Iran. I wrote the other day that I was holding my breath, waiting for today in Iran. Well, today is here. And so far, it’s been bloody. As I sit at my computer, casting about to find out what’s happening/has already happened (bearing in mind that Iran is 9 1/2 hours ahead of CST, where I am, which is to say: As I write at 10:35 am in Chicago, it is 8:05 pm in Tehran), I thought some of you might also want to know where to go to learn more. It’s important to remember that Iran kicked out virtually all foreign journalists in the wake of June’s post-election protests (here’s Amnesty’s quick take on those events, here’s a timeline of events during and since, and here’s leading Iranian dissident Akbar Ganji on what it all meant), and while some are there now, reporters are generally banned from covering any event that the government knows will be hot (and/or arrested if they do) — and, of course, internet service is tampered with all the time. So, journalists are doing the best they can, often from quite a distance. I’ve been checking the news sources of places geographically closer to Iran, websites that really covered the elections back in June, and the sites of news sources likely to have large Iranian ex-pat readerships. As is his habit, Andrew Sullivan is blogging prodigiously about events, almost liveblogging as information seeps out into the air. The BBC appears to have someone in Tehran, and they have a lot of useful analysis and background (such as this, about how the opposition is using the old slogans and symbolism from the 1979 revolution). You’ll also find a map locating some of today’s clashes. The Los Angeles Times has people reporting from Tehran and Beirut. Dubai– Doh! I meant: Qatar-based Al-Jazeera is nearly as close as you can get to Iran without actually being in Iran, and despite what many Americans think, they do good journalism. The New York Times is in Beirut and is posting video and pictures periodically. UPDATE: Robert Mackey is also doing a great job blogging about events on The Lede, at the New York Times. Ok. Back to obsessive reading. I hope that the sacrifices being made today by hundreds of thousands of Iranians serve them and their people, and that this may be the turning point for greater freedom — speedily and in our days, inshallah. Hand to God, I forgot to post! I even had a plan! So sorry! Truth be told, I’m not sure how many of you will be coming by in the next day or two, but still and all, it seems shabby not to post out of sheer forgetfulness. So I’ll give you part of the plan, which is this: David Sedaris, on the vast cultural differences in the celebration of our holidays. First up: Christmas in the Netherlands. Second up: Easter in France. My only suggestion is that you have Kleenex handy — for you will be laughing so hard, you will cry! But first: If you are of the Christmas celebrating type, I wish you a very, very Merry, Merry Christmas! May you enjoy love and warmth and a beautiful day full of all good things! And if those things seem a bit distant this year, I send you many warm, good thoughts, and all best wishes for a better 2010. Sometimes the holidays bring light to the darkness, and sometimes, we have to hold on until the light comes back. But it always comes, if we let it. One way to let it in is to laugh your socks off! And with that in mind, and with no further ado, I give you: David Sedaris! You may have heard: Grand Ayatollah Hossein Ali Montazeri, Iran’s preeminent cleric and a stunningly outspoken opponent of the regime, died in his sleep on Sunday night — and in an odd, even uncanny way, his death reads almost like a final gift to the hard-pressed opposition movement now struggling to bring change to Iran in the wake of June’s contested elections. Montazeri was an architect of the 1979 revolution, and the Ayatollah Khomeini (under whom Montazeri once studied) went so far as to name him his successor — but Montazeri came quickly to oppose the government he had helped to create, most notably decrying the secretive executions of some 4,500-5,000 political prisoners in 1988/9. His relationship with Khomeini severed, Montazeri retreated to the holy city of Qom, only rejoining the political fray with the rise of the reform movement in the mid-1990s. He came not only to support the reformers, but served as one of the movement’s most important voices — and for his pains, was placed under house arrest from 1998 to 2003. A political system based on force, oppression, changing people’s votes, killing, closure, arresting and using Stalinist and medieval torture, creating repression, censorship of newspapers, interruption of the means of mass communications, jailing the enlightened and the elite of society for false reasons, and forcing them to make false confessions in jail, is condemned and illegitimate. Though the government attempted to down-play his influence and position, Montazeri’s credentials as one of Iran’s most highly respected religious scholars served to protect him from the fate (jail, or worse) that met so many of the regime’s opponents in recent months. His funeral on Monday drew tens of thousands of mourning supporters to the streets of Qom, where a wave after wave of chants against the government could be heard. How can I possibly posit the loss of such a figure as a “gift”? This is how: Shi’ite mourning rites include a cycle of commemorations, coming seven days, a month, and forty days after death. Montazeri died exactly seven days before the Shi’ite holy day of Ashura — an annual day of collective mourning for Imam Hussein, the Prophet Muhammad’s grandson, martyred in battle in the 7th century. Ashura has always served as a potent symbol to Shi’ites of the power of martyrdom and sacrifice, a moment in the year in which believers hold most tightly to the notion that the world’s oppressed will someday overcome their oppressors. Montazeri, a revered religious leader who championed the oppressed Iranian people in the face of their oppressive government, will now be mourned alongside the great hero of Shi’ite Islam, his death folded into the story of Ashura, his years of struggle joined to the sacrifices that serve as the very foundation of his people’s faith. Already, Supreme Leader Ayatollah Ali Khamenei is being publicly compared to Yazid, the corrupt ruler responsible for Imam Hussein’s death. Ashura is this Sunday. Keep your radios and televisions on that day; listen closely, and keep listening in the days that follow. Whatever happens — good or bad, blessed or bloody — it will be huge, and it will involve thousands upon thousands upon thousands of Iranians. There is a very real possibility that this Ashura will be the day on which Iran’s story changes. Photo gallery of Montazeri’s funeral – note in particular the stunning third picture, of the Ayatollah under his burial shroud. After the Prophet – Lesley Hazleton’s exceptional account of the Shia-Sunni split in Islam, including a powerful section on the story of Ashura, and the role it plays in Shi’ite thought. Frank Lloyd Wright, Ernest Hemingway, and me. The other day, I solicited suggestions for what a person with writer’s block might write about. My buddy The Grand Panjandrum suggested in the comments that I write about my part of the world: Restaurants. Local music. Public Transportation. Interesting personalities. Museums. Art Exhibits. Parks and other public spaces. Architecture. The biggest challenge here is that all that is nothing I’ve ever written about! Well, music. I’ve written about music. And interesting personalities! Some of whom have been musicians. I tend to write very big (Israel/Palestine, the fate of the free world), or very small (missing my babies, wanting to be Marketa Irglova), the latter with the sense that sometimes the smaller you go, the more universal you get. I find tension, and heart, and big questions at the extremes, and these are what I like to write about. I find myself not bothering with the bits in the middle — I think in part because, as I’ve mentioned before, I’m lazy. The middle bits are where you find messy details that require real digging, and I like either a sweeping drama, or an intimate moment. And I don’t like to have to work terribly hard to get there. But as a writer without anything that really resembles a job, per se, if I don’t challenge myself, I won’t be challenged. So I’m going to mull this over a bit, and see what my brain turns up — if I have anything worthy to say about something that is close to hand, but not actually inside my gut. In the meantime, though, I can relate a little bit about that which ties me to (as GP said) “the part of this small planet I live in”: Oak Park, Illinois. We moved to Oak Park in 1998, so that I could get my graduate degree on Chicago’s south side, while my husband worked at a high-tech firm in the city’s western suburbs. At the time, I had no idea that my family was bound up in Oak Park’s history, but as time went by, much was revealed! Oak Park, as many know, was home to both Frank Lloyd Wright and Ernest Hemingway (two gentlemen who, if you ask me, had some pretty crucial screws loose. But I digress!). Oak Park loves its native sons, though they didn’t necessarily love it back (Hemingway famously described Oak Park as a place of “broad lawns and narrow minds.” The minds have since broadened considerably), and they are feted everywhere one goes. Well, it turns out that my great-grandfather, Oscar Balch, worked with Frank Lloyd Wright, as an interior designer. 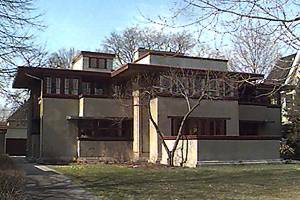 Wright eventually designed a house for the Balch family, on Oak Park’s Kenilworth Avenue, where my grandmother spent several years of her childhood. The Balch House is across the street from the home in which Ernest Hemingway grew up (not, all you Hemingway-philes, the one in which he was born) — and Hemingway’s younger sister, Carol, became good friends with my grandmother (whose name was Esther – a bonus clue as to both my Hebrew name and my online username). In the fullness of time, Carol Hemingway babysat for my father, Ted Hauser, and he so loved her that when his sister was born, he asked to name the baby Carol. In Oak Park, these facts render me something akin to nobility! Typically, though, while I find these connections oddly fascinating, the ones that really resonate are not those, but these: I eventually learned that my father also spent big chunks of his life in Oak Park, apparently in part because his maternal grandparents were here. In fact, after my daughter was born, I discovered that my father was born here, too — in the very same hospital, on the very same floor. And she, it bears noting, was born on the anniversary of his death. Six months later, after we bought the house in which we now live, I learned further that he spent at least one summer of his college years in a house just six blocks south, on the same street. I have no idea why he was there — he attended Oberlin College, and his parents lived elsewhere at the time — but I’m guessing that he might have been staying with his grandparents. As the daughter of a dead man (and, since he died when I was ten months old, I have never really been anything but), I find all of these odd hints and shadows and whispers of my father fascinating and tantalizing and deeply frustrating. I think that the latter is why I haven’t “found” the time to answer my questions (why the hell was he living in that house?). Because while the information might be interesting, it won’t bring me to him — and that’s all I’ve ever really wanted. Sometimes I walk down our street, or go to the movie theater at which he must have seen a film or two, and wonder what it all looked like, then, through his eyes. So there! A little something about (let’s see…) interesting personalities, and architecture, and literature (which while not asked for explicitly, I think falls within the general outlines of GP’s request! ), with a bonus stroll through my gut. Emily L. Hauser — full service blogger! Well, this just pisses me the hell off. American-Israeli Michael Oren, author and — oh yes — Israel’s ambassador to the United States has just told the world that I am “fooling around with the lives of seven million people” in pursuing a two-state solution to the Israeli-Palestinian conflict that is opposed by the current Israeli government. Moreover, he made this scurrilous accusation when speaking at the biennial convention of the United Synagogue of Conservative Judaism, of which I am a member. Or, in other words: The man walked into my house and accused me of not caring if my fellow Israelis die. And walked out. I am truly having a hard time marshaling my thoughts here without resorting to language as vulgar as the accusation. Did the man call me out by name? No, of course not. He cares not a whit about who I am or what I think (if he did, he might not have said what he said). No, Oren made his indefensible, heinous allegation not about me personally, but about J Street — an organization which I support, in both word and deed, and which would not exist were it not for the will of a hundreds of thousands (quite possibly millions) of American and/or Israeli Jews such as myself. In America, Jews who support J Street reflect the opinion of fully two-thirds of American Jewry — because that’s the percentage of Jewish Americans who believe that a two-state solution is what’s best for Israel and that, moreover, the American government should pressure both Israel and the Palestinians to achieve it. They are — we are — not marginal, nor are we cavalier about the lives of anyone. On the contrary, those of us who actively support a two-state resolution to this bloody, decades-long conflict have taken a good hard look at the constant, consistent, endless failure of Israel’s military to actually resolve, rather than manage and perpetuate, the conflict and have come to the conclusion that love of Israel demands a vigorous search for peace. That if we care for Israeli lives, if we want no more Israeli toddlers, babies, soldiers, mothers, grandfathers to die horrible, useless, pointless deaths — then we absolutely must commit ourselves to peace. I recently blogged about the roughly 2,000 people, Israelis and Palestinians, who have died since Israel first refused to negotiate the release of captured Israeli soldier Gilad Shalit (the release of whom Israel is now negotiating), but if we were to go back and count up all of the Israelis who have died since Israel launched its occupation of the Palestinian territories? Well, quite honestly, the spirit fails. I can’t bring myself to do that on this last day of Hanukkah. But suffice it to say that if there had been a peace agreement, most of those people would have died very differently indeed. [J Street is] a unique problem in that it not only opposes one policy of one Israeli government, it opposes all policies of all Israeli governments. It’s significantly out of the mainstream.This is not a matter of settlements here [or] there. We understand there are differences of opinion. But when it comes to the survival of the Jewish state, there should be no differences of opinion. You are fooling around with the lives of 7 million people. This is no joke. Needless to say, the assertion that J Street “opposes all policies of all Israeli governments” is so absurd as to be laughable (“all” policies? Really? J Street has a problem, with, say, kibbutz subsidies? Not to mention: Remember Yitzhak Rabin, Mr. Oren? Remember the policies of his government — policies for which an Israeli Jew killed him? ), but never mind that. It’s clear that the man was fuming, and he lost the plot for a second. The plot being to impugn me and mine, and to accuse me of a callous disregard for the very lives that I have spent the better part of a quarter of a century fighting to protect and improve. I am J Street, Mr. Oren, and you owe me one hell of an apology. /knocks on side of head/ Nope! I got nuthin’! I have been struggling all day to come up with something to write. I feel I owe it to the folks who come by here, daily or occasionally, as well as to myself, because after all: I have set myself up as a provider of the Daily Blogging! But I can’t for the life of me think of anything I want to write about. I think this is a combination of many factors, including (but not limited to): my earlier recorded angst/desire to deal well with said angst; my long-held hesitation to deal critically with Israel/Palestine during Jewish holidays (talk about your buzz kill! ); and my sheer exhaustion over the troubles that face these United States/the world community/the planet. So… yeah. I may need to move on to puppehs and cute shoes. Rabbi Brant Rosen on the fact that an alarming number of Jerusalemites are being kicked out of their homes for the crime of not being Jewish. Matt Yglesias on the nature of politics and why better-than-nothing is actually better than nothing. One of my favorite xkcd comics in the history of EVAR! If you guys out there, in your teeming millions, have any thoughts about what you’d like to see on this blog — or any other thoughts on what is clearly a case of writer’s block, because I mean, please: Look at yesterday’s post! — please feel free to leave your ideas, suggestions, rambling notions, etc in the comments! Q/A + Good stuff: The Swell Season, ctd. Occasionally, I get actual questions in the comments, and given Rule #6, I feel that I must answer these questions in post form! 1) “Applesauce or latkes?” absurdbeats asks — to which I can only reply: Why would you force me to choose? I thought we were friends! 2) “How can I contact you?” To any and all who want to get in touch more directly, you’ll find my email contact on the About page. Please write early and often! (And slumdogmamabear, I’ve already sent you a note!). 3) “Should I tell everyone I know — particularly those who are rich and famous — about your fabulous blog?” You know, I am beginning to suspect that this question is but a figment of my fertile (and fabulous!) imagination, but I hear it so often from within the confines of my head, that I feel I must answer! And the answer is: Yes, yes, you most certainly should! And since that’s a really poor excuse for a post, and I’m not likely to have a chance to do any thing more impressive today, I’ll leave you with this, too: A really nice interview with The Swell Season (check out the hole in his guitar! It’s bigger than I thought! ), from Boing Boing video. Enjoy! I mentioned recently that I’m cold. It’s that time, that hunkering down and covering up time, that time when all the world seems still and sharp and withdrawn. Waiting. That time when the people of the world eat. I spent the vast majority of my day today at the kids’ school, making latkes. Making, and making, and making latkes, for 40 kids, and two teachers, in two separate classrooms, + extra, for whatever teachers might be drawn into the teachers’ lounge by the magnetic smell. But I wasn’t the only one there. There was the dad making pizza, his family’s entry in the bread unit (loosely defined) that the K-1-2 classes are doing right now. There were trays and trays of cookies and cakes and meringues and white chocolate-covered pretzels and more cookies and yet more, arranged around a note from the recently retired head of the lunchroom, telling the school’s staff how much she missed them all. There was the holiday luncheon (the only part of which I really registered was the pulled pork…. [which I can kinda still smell…]). There were the tamales prepared by the K-1-2 teachers themselves, another entry in the bread unit (loosely defined). The room and the entire school were fairly bursting with special, lovingly prepared food, each an expression of the very best of human interaction. The days grow cold. We go inside, and feed one another. It made me so happy to be there, warned of open oven doors and helped with things placed too high, chatting and looking for the dish soap, tasting and sharing and giving and getting, laughing about — nothing really. Just, you know: Laughter. I felt held. I felt wrapped. I felt – warm. Yep – always. And maybe a bite to eat, too.